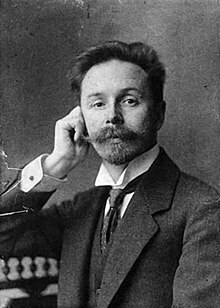 Alexander Nikolayevich Scriabin (Roushie: Алекса́ндр Никола́евич Скря́бин, Roushie pronunciation: [ɐlʲɪˈksandr nʲɪkəˈlaɪvʲɪtɕ ˈskrʲæbʲɪn] 6 Januar 1872 [A.S. 25 December 1871] – 27 Aprile [A.S. 14 Aprile] 1915) wis a Roushie componer an pianist. Scriabin, wha was influenced early in his life bi the wirk o Frédéric Chopin, componed warks that are chairacterised by a heichly tonal idiom (thir warks are associatit wi his "first stage" o composeetional ootput). ↑ Scientific transleeteration: Aleksandr Nikolaevič Skrjabin; an aa transleeterated variously as Skriabin, Skryabin, an (in French) Scriabine. ↑ Scriabin, Extensive Biography. Pianosociety.com. Retrieved December 26, 2014. This page wis last eeditit on 13 November 2017, at 07:09.